Youngsters Theology: Putting the Christ back in X-mas....? Putting the Christ back in X-mas....? Put the Christ back in Christmas! How many times have you heard this? How often do you see stickers or Facebook posts claiming to put the “Christ” back in Christmas? There have been many arguments against the abbreviation of Christ to “X” and about how Christ has been lost in the very season that we celebrate his birth. Well, I am here to argue also. But argue a very different, very important topic. First I will start with the “X-mas”. Many people believe that the abbreviation of Christ to an “X” is a fairly recent occurrence. And in today’s society many people find the “X-mas” offensive. Well, did you know that the letter x has been used as a symbol for Christ since around year 300? It comes from one of the first christograms. Have you ever seen this image before? This may be a symbol that we see all over the place yet never asked ourselves what it meant. 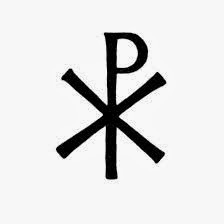 Well, this symbol is called the Chi Rho. This image comes from superimposing the first two letters of the Greek word for Christ ("ΧΡΙΣΤΟΣ"). The symbol was designed to invoke the crucifixion of Jesus and also to represent the status of Christ. Hmmm…that is an interesting point. Now, it is my personal opinion that it is up to you to decide what you believe. If you believe that using X-mas is offensive. I have no problems with that. However, I will ask that you understand where these things come from and truly understand the meaning why things are done. Knowing what we now know about the Chi Rho, does it make a little bit of sense way X-mas can make sense? I do believe that consumerism and materialism have become so over powering that many people do not fully understand the meaning of Christmas. What the holiday means and why we celebrate it. But if we take a step back, is this a problem that we only encounter during the Christmas season? As Christians we are called to live and show the love of Christ to everyone, at all times, no matter what! Notice how I said “at all times” not “during Christmas”. Yes, we can argue that Christ has been lost when it comes to the Christmas season. But if we take a look back at the events of last week…one day we gather with family and friends and give thanks for all of the wonderful blessings in our lives. We bless what we have and give thanks. Black Friday- because only in America people trample each other for sales exactly one day after being thankful for what they already have. This comment really stood out to me. Then we forget it and keep living our lives the way we want to, not the way we know we are suppose to. Let’s all strive to DO better…not just say better. Stop only doing the talk, but do the walk. They greatest way to spread the love of Christ, to show what it means to be a Christian, to evangelize, to spread the good word, the absolute best way to speak to someone isn’t to tell them about it. Have you signed up yet? If you have ever questioned God, Jesus, faith, life...you are a theologian. Theology comes from a combination of the Greek words theos and logos. Theos meaning "God", and logos which means "reason", "wisdom", or "thought". So, God-thought. In this sense, we are all theologians. Jesus calls us all to "become as young children" (Matthew 18:3). We are all told to "have faith like children". Therefore, we should and are all, Youngsters and Theologians.